Apart from the palaces, forts and castles, Gujarat is blessed with the presence of many spiritual architectures well. The temples, mosque and mausoleums architectures of Gujarat are of the great contributions of the culture. 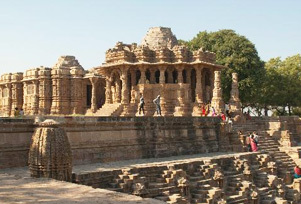 Some of the finest temples of Gujarat were found during the Solanki dynasty. In the heritage of Gujarat, one can see an influx of Muslim Arabs and Persians. Muslim rulers created gateways, monuments, and multi-storey architectures. Muslim Arabs and Persians have improved the pallet of Gujarat architecture by introducing some concepts like half-doomed portal, domes, stalactites, squinches arches, pendentives, and honeycombing. Other religious communities too had a long term association with Gujarat. During the colonial period, there was a tremendous increase in the number of churches. Even Parsis arrived in Gujarat when they fled from their prosecutor in their homeland in Persia. Historians even say that Guru Nanak has travelled widely in Gujarat when he was embarking on a trip to Mecca via Lakhpat. Akshardham in Gandhinagar, Sun temple at Modhera, Toran gate at Vadnagar , Shiv Shakti Mandir and Lakha Dera Jain Temple in Vijayanagar, Navlakha temple in Ghumli, Dwarkadhish temple in Dwarka, Jama Masjid in Champaner, Jami Majid in Ahmedabad, Mahabat Maqbara in Junagadh, Sidi Sayyid Mosque in Ahmedabad, European tombs, Badshah no Hajiro in Ahmedabad, Rani no Hajiro (Queen's Tomb) in Ahmedabad, and Gurdwara Lakhpat Sahib in Lakhpat are the most stunning examples of spiritual architecture in Gujarat.